It is very annoying to float to the surface all the time if you want to lie on the bottom and wait for the fish as a spearfisher. Therefore, it is important to have some sort of weight on when you are diving. But how much weight and what kind of weight is best? This post will help you on your way. It is difficult to give direct recommendations on how much weight you need as a sperfisher as this will depend upon a lot of things (for example if you dive in salt or freshwater, how thick your wetsuit is etc). 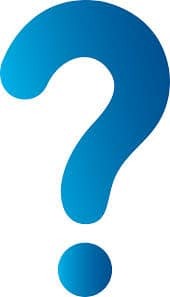 It is, however, possible to give some advice on what kind and how the lead is to be used, and you will find these guidelines in this blog post. Why you should use lead as a spearfisher. How much lead you need for underwater hunting. Weight belt – nylon belt or rubber belt? Choosing a weight west if you get pain in the lower back during spearfishing. 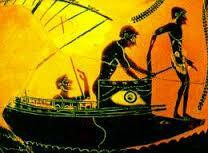 In ancient Greece they used a stone with a rope to dive deep (see “Skandalopetra”). Back then they did not have today’s possibilities with coated lead weights, backlead, etc., but you still had a need to adjust the buoyancy … which is why they used stones. Lead is more suitable for underwater hunting than stone, as it has a greater density, and therefore you don’t need as much bearing down. Why should you use weight as a spearfisher/freediver? Is it possible to dive underwater without weight? Diving weight is used to achieve a perfect balancing on the depth you want to hunt. The weight you choose will depend on the hunting technique (there are differences in whether you want to lay at the bottom or swim after the fish). See our article on hunting technique. A weight vest can be used to achieve better balance and to protect the lower back. Ankle weights can be used to keep the fins down. 1 kg and 2 kg blocks of weight are preferred since they offer more flexibility. You should always use rubber belts. Use black weight blocks – An underwater ninja do not use yellow blocks ;). Neck weight is only for freedivers (performance diving) and should not be used for freediving. Neck weight is often seen with freedivers, as this form of weight gives the best performance. But neck lead is not as comfortable and is therefore not used for underwater hunting. In spearfishing it is not so much performance as it is the experience that is at the center. The most flexible and comfortable situation is often to have the weight around the waist, or on the back. How much lead should I carry? As a spearfisher, you should adjust your amount of weight to the depth you want to hunt on and the technique you want to use. You need the most weight when you want to sneak up on prey or lie still on the bottom (e.g., when mullet hunting). Here it is important that you do not splash around, as it will scare the fish away. This type of hunting will typically take place in shallow water (0-2 m). For this you need to be heavy! It can be unpleasant to be heavy if you are diving in deeper water, as you will have to spend more effort to getting to the surface. Deep underwater hunting, is the area where you need the least weight. The deeper you dive, the less weight you want to wear. It’s all about being perfectly balanced in the depth you want to hunt. But remember to experiment with caution. Want to change the depth you dive in? Use less weight! Do you want both to swim in shallow and deep water? Then you can use heavy stones to hold you down when you are in the shallow water. If possible, you can put the stone under the wetsuit. When you swim into deeper water you just throw the stone away. 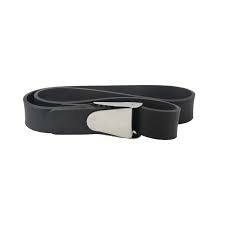 Your weight belt should always be an elastic rubber belt. A rubber belt can be strapped tight and creates friction against the wetsuit. This will prevent the belt from sliding during the dive. Do not use a nylon belt! 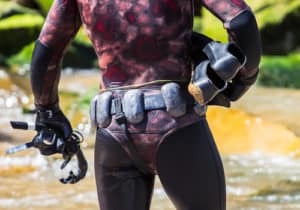 It is uncommon to have nylon belts as a freediver and spearfisher. Thos are only for scuba divers. 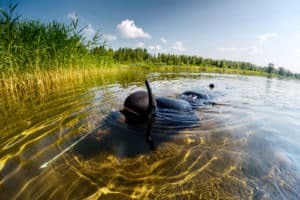 A nylon belt slides on the body and ends up under your arms when you turn upside down (freedivers also do this – but it is not often the case for scuba divers). A rubber belt is flexible and can be tightened a little extra without feeling too tight. The friction of the belt against the wetsuit will prevent it form sliding around. I like rubber belts that have metal clasps of the type “Marsellaise.” There are a number of these types of weight belts. Lead is a toxic material that you should be careful with, especially if it does not have coating (“wrap”) or other protection. Lead is a potential neurotoxin that can damage nervous connections and cause damage to the brain (especially in infants). In ancient Roman lead was used in water pipes. There is a theory that this particular incident contributed to the emperor’s insanity and the empire’s downfall. Back pains? – What weight belt should I choose? When you are hunting in shallow water you looking forward a lot. This can be hard for the neck and you have to sway the lower back. If you are unlucky, your sway in the lower back is right where you have your weith belt (though you should have the weight on the hips rather than in the lower back). After a couple of underwater hunts, this can give you a very sore lower back and it can become a real nuisance. Weight west – There is a solution. 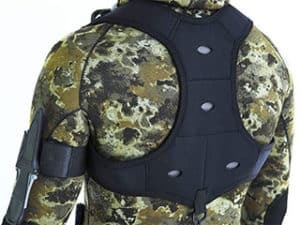 The solution is to move the weight from your waist to your back by means of a weight vest. Weight vests are available in many designs and some even their own at home. They work well for underwater hunting, but their lack of streamlining and tendency to fall into the neck, when you have your head down, makes them less suitable for feediving. It can sounds strange to receive weigts in the mail, but it is actually possible. Often the shipment cost in web shop are not that higher even when you order some kilos (lb’s) of lead. Weight vests are made of neoprene, which does not weigh anything in itself. Some vests have specially crafted lead plates which fit the vest; be aware that you order these with the vest. Weight vests are more comfy, but are slightly more expensive than traditional lead. If you are buying a rubber belts each lead blocks should be about 1 kg – 2 kg (2,20-4,40lb).